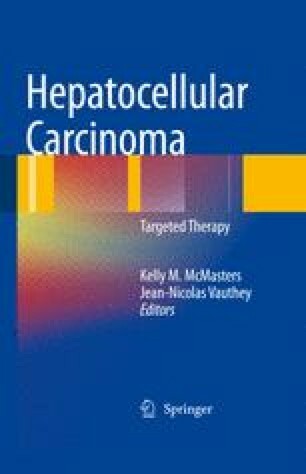 Hepatocellular carcinoma (HCC), the most common primary liver cancer, occurs in >90% of the cases on an underlying hepatic disease . Screening programs allow diagnosis at an early stage where curative treatments can be proposed. These include liver resection, percutaneous radiofrequency ablation, and liver transplantation [1, 2]. Even if liver transplantation is the best treatment for early HCC by removing both the tumor and the underlying liver disease, shortage of donor organs and dropout from the waiting list limit its efficacy . In recent years liver resection in cirrhotic patients became safer [4, 5] and achieved a key role in HCC treatment: in advanced tumors it is the only therapeutic option, while in early tumor it can be proposed as an alternative or a bridge to liver transplantation [6–9].